This posting is completely different from any other I have written – no recipes, no pictures, essentially a list of rums and nothing more. This installment of the luxurious time I spent at the Miami Rum Festival has to do with the rums I experienced, and my immediate and brief thoughts on them. Out of the large roster, some rums I knew of very well, some I have on my shelves at home, some I have heard of, some I have not, and a special few bottles I have waited a long time to see. I did not taste every single rum, nor stopped at every booth, either because I knew enough, or simply did not have enough time. Also, I did not taste every rum at each booth for the sheer reason of keeping my head and not getting so inebriated I could not discern fact from fiction. I had to resort to near blasphemy: Throwing into the trash an exquisite rum time after time so that I would not ingest every drop of rum I took in hand. One of my regrets was not taking a picture of every rum I visited (or revisited). After all, sometimes seeing a bottle with the brand’s label on it makes the description more conspicuous. For that I apologize. Click here to go to the festival’s website listing of rum bottle images. I also wished I would have taken more pictures of the grand view of it all. On my festival program, I kept track of each rum I tasted by rating it (the ranking is between 0 & 4), whether I would buy the rum (or better yet – “will” buy, or without a doubt – “MUST” buy…in a way ranking the rum in another fashion), and finally a few words to differentiate each from one another. Below resembles what I wrote in my program, but with more words and less symbols. The Fog Cutter is one of those drinks I have lifted on high in massive glory, a neon-lit icon for all to see as a genuine representative of tiki drinks, like the Zombie, Mai Tai, and Hurricane. Even though there are many others (seriously – there are a lot of tiki drinks…thank goodness), some drinks are simply born with spot-lights of fame because of a person’s imagination. A long time ago, as in before my drinking age, if I were to describe a Zombie, it would have looked red, as well as a Mai Tai, and for some reason imagining a Hurricane as a blue drink. When I learned what the drinks truly were, and they became real to me, the lofty heights of my given stardom no longer appeared so unreachable. Reality replaced fantasy, and appreciation changed my perception. 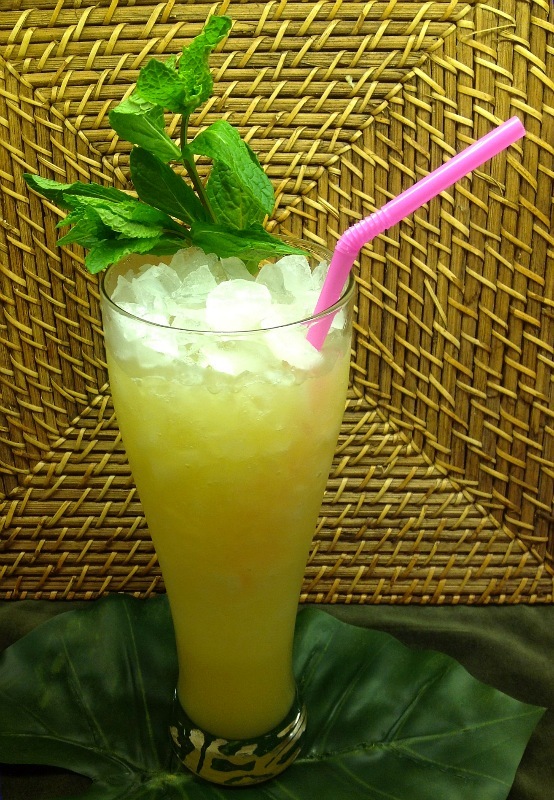 The Fog Cutter, once again, is a drink with questionable origins, whether invented by Trader Vic, Tony Ramos, or from Edna Earle’s restaurant, which Fogcutters was named after a diving knife. And for those of you who enjoy trivia, which has nothing to do with the Fog Cutter, the term Cutty Sark originally was not for the British clipper, but named for women’s undergarments. Cutty meant “short” – Sark meant “shift” or “chemise.” First came the underwear, then the famous ship, then the Scotch whiskey. I guess the bottle would look pretty silly with something other than a sailing vessel on its label. WARNING: Anyone allergic to almonds should not ingest orgeat. However, “Almond Flavoring” precisely printed on the bottle should be harmless. If you don’t want to buy a bottle orgeat, or make your own, which is easy, another option is to add a few drops almond flavoring (from the grocery store) into simple syrup to give a neighborhood taste – a couple drops for 2 ounces. I mean, the flower water really makes the flavor profile, not simply almonds, and there really is not substituting orgeat for something less. But almond flavored syrup is close enough in a pinch. I used to think, “Maybe if I substitute another kind of nut flavor it will be alright, after all – it’s just a nut flavor, right?” Since then, I’ve experimented, trialed-and-errored, and learned the inventors of drinks could have used Frangelico instead of orgeat, but didn’t. Could vodka work just as well as gin, if not better? No. The recipes are in writing. They are permanent. New drinks can be made using the old recipes as guides, yet cannot be called the same thing. It’s all about flavor. Bottom line: Please try the original flavor of a drink first. If you don’t like it, of course change it. If you don’t have the ingredients at first, make it as close as you can. But please, strive to get the original ingredients. With that said, I substituted out the sherry. I don’t like sherry. I learned from Beachbum Berry’s Remixed (all hail Jeff “Beachbum” Berry! ), whatever you float on top of a Fog Cutter is allowed as long as you alter the name of the drink. For example, if I wanted to float Maple Crown Royal, I could call it a Canadian Fog Cutter, or Fog Cutter Flapjacks, or whatever you can think of, whether prestigious or playful. Your drink – your name. Plus, once you drink a Fog Cutter, you’re not going to listen to another word I say. If by chance your mood carries you into two of these drinks, your opinion will suddenly grow to monstrous heights, and might crush us all under your bootheel of wisdom! Shake everything with cracked ice – except the mix. Pour into tall tiki mug and add more cracked ice to fill. Float sherry on top of drink. Garnish with mint. Drink with a straw. If you have trouble with the technique of “floating” and the liquid flows down too far into the drink – remember to pour slowly, perhaps using an up-side down spoon to help slow the pour. As you can see by my picture, my float sank like a stone. Obviously I need more practice, if you understand my meaning. Also, I don’t have a Fog Cutter mug yet, and feel I should have gotten one by now. After all, the drink and the mug are practically synonymous. Just for curiosity sake, I made two drinks, substituting lime for the lemon, simply to see a side by side comparison. They look the same, and both taste extraordinarily good. My wife prefers the lime, while I favor the lemon because I can taste the gin better with lemon.